I'm constantly changing up my looks because, to be frank, I get bored and I like the challenge of changing things up. At my last job I not only switched up styles but, I also switched between wearing contacts and wearing glasses and one of my managers would comment to me that she couldn't figure out who I was from afar since I looked different all the time. I'm sure that's not such a good thing for a work environment per se but, from a style perspective, it's great! While I normally gravitate towards edgier/urban looks, I love a classic, ladylike style. Wearing this sheer shirt isn't considered ladylike but it does create interest and edge, which is right up my alley. I'm the same way, pretty unpredictable stylewise. I love your ladylike look. This blouse is very pretty and the skirt is one of my faves of yours! I think I love the earrings best. Everything is always statement necklaces these days. 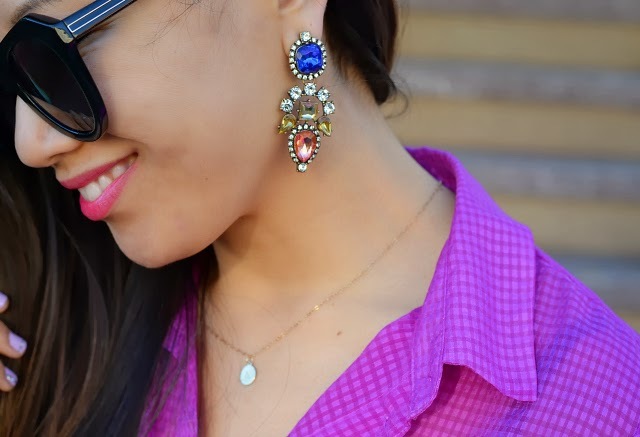 It's lovely to see a statement earring! Love that skirt and the whole look actually. I have been looking for a skirt like this. You look gorgeous. I love this purple top, what a pretty color on you. I LOVE that skirt! I wish I could find one like it! This style works great for you too, Nancy! I especially love how much colour there is and the fullness of the skirt. What a gorgeous outfit! I love the combination of colours, and the unexpected sheerness of your blouse is a beautiful touch. Thank you SO much for your lovely comment! Made my day! You look absolutely stunning in your OOTD! I love this look so much, and you have the PhillipLim bag that I was unfortunate to get my hands on! You work it well girl! Your sunnies, I need them, they're so cute, I love the frame. when i saw the title, all i could think of was BH 90210. Great post dear! I so like the whole look. Looking forward to seeing your future posts. This is super cute and love the silhouette! I also love that you change around your style and you're not afraid to experiment! that's why i like your style. it's not cookie cutter and you put things together effortlessly. your style is very unique. great top! i want that skirt too ! I love how red and purple looks together! Those earrings are fabulous. Love this lady like outfit - so pretty! I would never think to pair this shoes, it looks fab! Aw, I wish Karen Walker sunglasses looked as good on me as they do you - my head's apparently too big! Love this outfit and I love how you added a bit of edginess with a darker bra under your shirt. I am not bold enough to pull of this look but it looks great on you! I love your skirt! So classy! you look lovely! i love that skirt. i love how it flares/poofs our just a little bit. Great mix of colours and textures. This fuchsia color looks amaaaaaazing on you! You look so cute, the skirt is perfect! What a gorgeous, ladylike look. Great patterns and textures on all of the pieces you're wearing here, girl!